Ever get sick of huddling around your friend’s smartphone while they show you a video? Looking over someone’s shoulder to see vacation pictures or the hottest new music video isn’t exactly fun for anyone (except for the person holding the phone). Hooking a phone up to a tv is pretty much impossible, and actually buying a projector is about of the question unless you have a thousand dollars laying around. But what if I told you that all you needed was a few basic household items, and a blank wall to enjoy hours of fun watching videos, movies and looking at pictures without having to awkwardly crouch over a tiny screen? 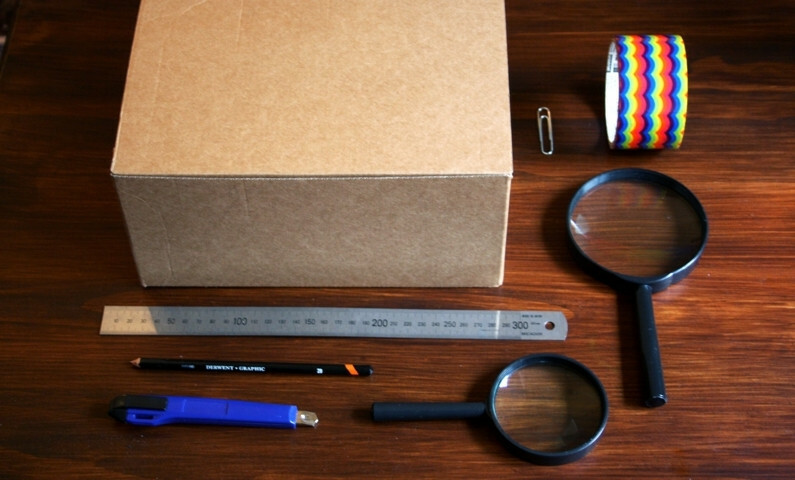 All you need is a small box, a magnifying glass, paper clip, smartphone, a box cutter and some duct tape. Trace the outline of the magnifying glass and cut a hole for it to fit into, and tape it in place so no light leaks out of the cracks. If you want the best image possible, paint the inside of the box black. Make a hole in the back, and poke your charger through. Use the paperclip to make a stand for your smartphone. In order for the projection to come out right side up, you need to make sure the your smartphone screen is flipped upside down in the box. This will require you to change the settings, or if you have an Android download an app so the screen will stay in the right position. Adjust the phone inside the box to make sure it’s focused, then kick back and enjoy the show!